Security encompasses much more than the deployment of armed forces. Effective judicial and quasi-judicial institutions serve as an important means of defusing societal conflicts and provide a check on a state's use of coercive force. Tensions were high in the lead-up to the first round of the Kenyan presidential elections in August 2017. Polls suggested a very tight race between the incumbent, Uhuru Kenyatta, and longtime challenger Raila Odinga. When results showed Kenyatta winning with a surprisingly large margin, the country braced for a fallout, recalling the ethnically based violence following the 2007 elections that led to an estimated 1,500 deaths and the displacement of hundreds of thousands. Instead, the opposition took its case to the Kenyan Supreme Court. In a landmark decision, the Court ruled the election null and void on the basis that the national electoral body had failed to adhere to the established practices for conducting the election. Rather than having to take to the streets, the opposition had found justice by working within the system. This experience illustrates the often overlooked reality that security encompasses much more than the effective and efficient deployment of armed forces. Justice—in terms of both substance and procedure—is essential for security and stability. As social goods, justice and physical security are perhaps the most foundational necessities for peaceful coexistence in society and the survival of the state itself. Effective judicial and quasi-judicial institutions not only serve as a check on political power but also prevent or mitigate conflicts that might arise from inevitable competing societal interests. Justice institutions and the criminal justice system, thus, form an integral part of the security sector. One practical linkage between justice and security arises out of relations between civilians and the security sector. Courts play a critical role in ensuring the oversight and accountability of the security sector. They demarcate the scope of the security sector’s mandate and resolve legal disputes that arise when confrontations between members of the security sector and citizens result in human rights violations. When security forces are not held accountable under such circumstances, civilian-security sector relations suffer. In Burkina Faso, 24 military enlisted men and officers including the former head of the Presidential Guard were put on trial in 2015 for crimes against humanity as part of the government’s efforts to reform and professionalize a discredited security sector. In Kenya, only a small number of policemen were tried for the murder and sexual assault of civilians after the 2007-08 post-election violence, and only a handful were convicted. This has reinforced a culture of impunity in the security sector, with serious implications for its ability to build trust and legitimacy in the eyes of the public. In the Democratic Republic of the Congo, entrenched impunity and weaknesses in the criminal justice system undercut the work of military courts, the only viable institutions that try servicemen for serious crimes involving civilians. As a result, trials appear to have had little effect on persistent and increasingly widespread violations committed by soldiers and allied militias against civilians. Justice is vital for the mitigation of other types of conflict as well. Resource conflicts, particularly cattle rustling and farmer-herder competition over land, pasture, and water are among the most common conflicts experienced in agrarian regions. In northern Nigeria, conflicts between nomadic herders and agrarian communities across a band of 10 states resulted in the deaths of more than 12,000 people between 2011 and June 2017. In Madagascar, cattle rustling by the dahalo (“bandits”) pose a serious enough security concern to require the mobilization of the national army. In South Sudan, the national political conflict overlays complex resource competition over pasture and water between herding and farming communities. The conflict in Central African Republic (CAR) that pits mostly Muslim herders against largely Christian farmers manifests similar characteristics. Cross-border cattle rustling involving gun violence along the Kenya-Uganda and Kenya-Ethiopia borders continues to wreak economic havoc on warring communities in these barely governed spaces. 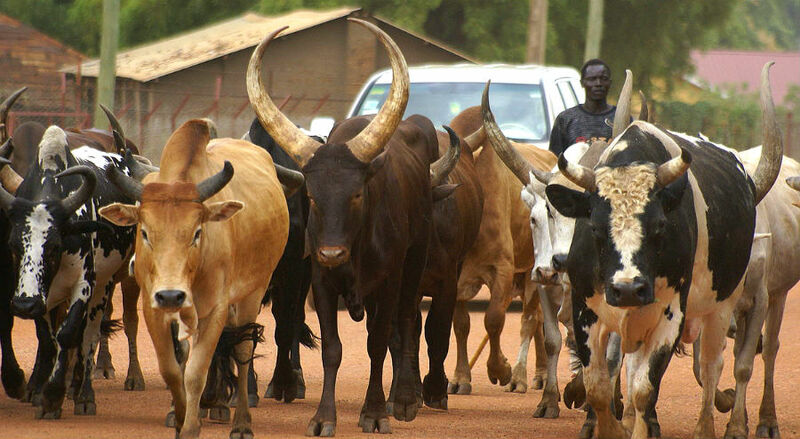 A Dinka man herding cattle in South Sudan (Photo: Ranjit Bhaskar, via Al Jazeera English). In all of these land dispute cases, evidence shows that ineffective legal protections for life and property, as well as ineffective adjudication of disputes, are at the root of many of these resource-related conflicts. The limited reach of formal justice institutions in these peripheral areas coupled with the degradation of traditional justice and conflict resolution mechanisms exacerbate conflicts. This also applies in northern Nigeria, where disregard of tradition by a newer generation of herders has made conflicts more deadly. Younger herders feel less attached to age-old traditional conflict mechanisms. Instead, armed force is their recourse when conflicts arise with settled communities. In CAR, the replacement of traditional conflict resolution mechanisms with Islamic law in areas controlled by Seleka rebels during the civil war has weakened a traditionally important system of justice with cross-community appeal while further fueling the conflict. In southern Sudan, the Dinka-Nuer Wunlit peace conference of 1999 involving community leaders from the eastern and western banks of the Nile brought to an end one of the area’s most violent resource conflicts. Members of the Dinka and Nuer communities had been caught up in a violent conflict involving blood feuds, disputes over pasture, and abductions of women and girls. The signing of a peace agreement by tribal chiefs from two of southern Sudan’s largest communities had a powerful domino effect. It unified warring southern leaders and accelerated negotiations that culminated in the Comprehensive Peace Agreement with Khartoum. The Wunlit modality was replicated in 2012 to address the intractable land-related conflicts in Jonglei state. Research has documented over 100 active border disputes in Africa, most of which arise from the arbitrary parceling up of the continent by European colonial powers and failure by successive governments to ascertain and mark borderlines. As the capacity of African countries to exploit resources in the borderlands grows, so does the potential for conflict with their neighbors. This calls for effective conflict resolution mechanisms. Judicial remedies provide an important means for resolving such border disputes, as identified under Article 33 of the UN Charter and Article 4(e) of the Constitutive Act of the African Union. Over the years, African states have often put their faith in judicial institutions such as the International Court of Justice (ICJ) and arbitral commissions when border disputes prove difficult to resolve. Seven border-related cases have been decided by the ICJ since the 1980s. The ICJ’s decision in 2002 on the long-running and complicated dispute between Nigeria and Cameroon illustrates how courts can defuse volatile conflicts. To play a role in the resolution of disputes, justice institutions must be economically and physically accessible to all, including to pastoralists that often inhabit the geographic margins of the state. Whether they are integrated into the formal justice system or not, traditional justice and conflict resolution mechanisms enhance security by providing a culturally appropriate avenue for recourse. The independence and capability of institutions that adjudicate disputes and dispense justice is essential for their legitimacy. The more that they appeal to populations because they can be trusted to be dependable and impartial, the greater impact justice institutions can have on stability in Africa. African Union, “Final Report of the African Union Commission of Inquiry on South Sudan,” 2014. David K. Deng, “Challenges of Accountability: An Assessment of Dispute Resolution Processes in Rural South Sudan,” South Sudan Law Society, 2013. Ernest Uwazie, “Alternative Dispute Resolution in Africa: Preventing Conflict and Enhancing Stability,” Africa Center for Strategic Studies, Africa Security Brief No. 16, November 30, 2011. Idi T. Gaparayi, “Justice and Social Reconstruction in the Aftermath of Genocide in Rwanda: An Evaluation of the Possible Role of the Gacaca Tribunals,” African Human Rights Law Journal, Vol. 1, No. 1, 2001.